The hibernative mind of Real Estate Professionals causes many to agonize at making a living in this wonderful industry; this is why those who truly succeed in the long run are a very small percentage of all licensed professionals. 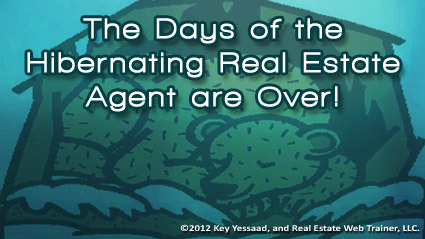 As Fall and Winter approach Real Estate Agents start behaving like bears who realize that the feeding will be rough, and must start to hibernate. They buy into the idea that we live in a society that likes to hunker down for the holidays (Halloween, Thanksgiving, Christmas, Winter, etc) and reawakens in the Spring; a model well suited for the 50’s, 60’s, and I will even give you 70’s. Yet we are an ever changing people; few of us ever work for an IBM and spend their whole working career at the same place; we are a society of nomads who must adapt to the working conditions of our today’s reality. Real Estate Professionals must remember a simple mantra; we work when others rest; and yes that means we work weekends; we work later than most; and our days off are best suited for Tuesdays of Wednesdays. Is it tough…? Yes! But it is what you have chosen to embrace as a Real Estate Professional. Postpone your hibernation from now on and continue to prospect even though the leaves are changing.